Duke University Marine Lab in Beaufort is involved in research using drones to document marine debris on beaches around the world. We discuss the RACE FOR WATER project, how plastics impact the environment and how similar drone technology eventually be used along the coast of North Carolina. It’s a growing problem around the world and here in eastern North Carolina. Marine debris not only impacts the water quality, it also harms whales, sea birds, seals and sea turtles that mistake floating plastic as food. On March 5th, a 700 pound leatherback sea turtle was discovered washed up on the beach near Rodanthe. Suffering from declining health and a shark bite, the leatherback sea turtle, an endangered species, had to be euthanized. Associate Professor of Aquatic Animal Medicine for NC State University Dr. Craig Harms says during the necropsy, plastic was discovered in the turtle’s stomach. 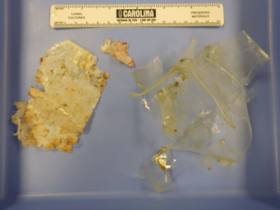 Several pieces of thin plastic were found in the sea turtle's GI tract. Leatherback sea turtles are jellyfish-eaters, and frequently mistake floating plastic bags for their food. Dr. Harms says the leatherback also had foam in her airways, indicating that she could have become entangled in a net or trawl. Unfortunately, these types of events are happening more and more as trash is being introduced into the ocean. Marine debris enters the water in a variety of ways. It’s washed into rivers and streams and eventually flows into the sea. Debris can also come from ocean based industry and ships. Plastics washes around the ocean and eventually comes ashore or collects in one of five rotating garbage patches in the world’s oceans, called gyres. These are areas of floating debris that routinely choke out sea life. Now, Duke University Marine Lab in Beaufort is involved with a project using drones to document the amount of marine debris washing up on beaches around the world. Assistant Professor of the Practice of Marine Conservation Ecology Dave Johnston says the “Race For Water” project started about a year ago. 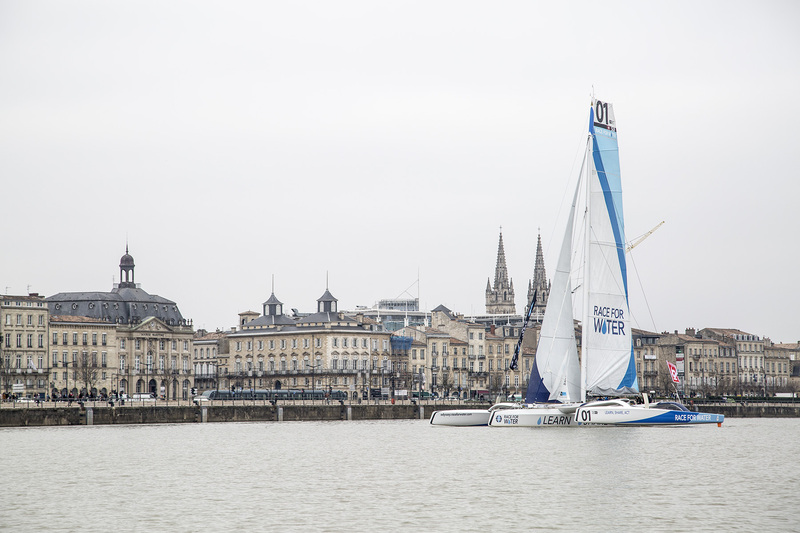 The project involves a group of sailors who are attempting to circumnavigate the globe in a trimaran, a racing sailboat similar to a catamaran, but with three hulls. 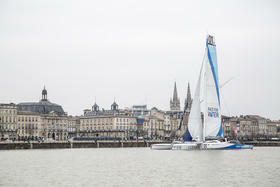 The ship departed the port city of Bordeaux France on March 15th. It’s currently docked in Bermuda. During the 300 day voyage, the crew will document marine debris and visit gyres. Instead the quad-copter drone you’re probably familiar with, the research group is utilizing a small Styrofoam airplane to collect data and images. The drone is equipped with a specially designed red-edge camera that helps scientists detect the presence of plastics along beaches. The images collected during the drone flyovers are sent to Johnson and his students from the sailing vessel to the Duke Marine Lab in Beaufort for analysis. He says documenting debris in the oceans and on beaches allows researchers and managers to understand the origins and persistence of different types of plastic and how they interact with marine organisms. 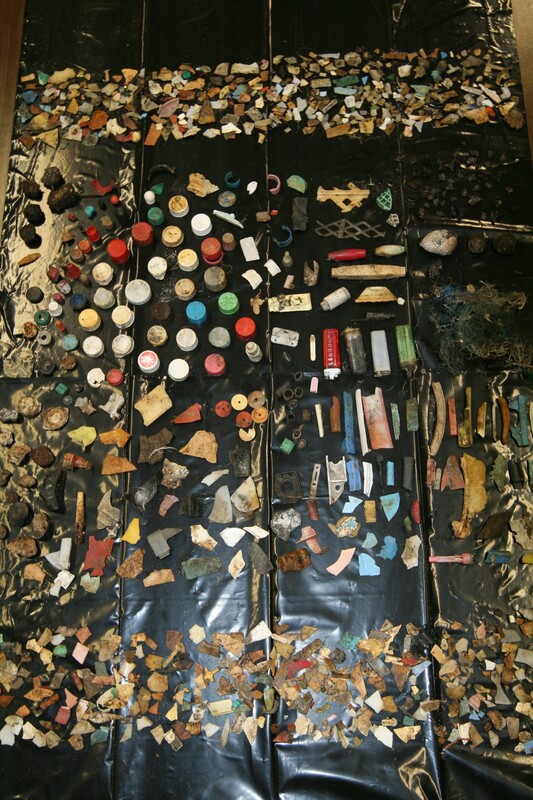 Johnston says in 2010 alone between 4.8 and 7 million metric tons of trash entered the ocean. The impact of marine debris on animals is widespread, even on a tiny scale. With this seemingly insurmountable problem, Johnston says drone technology is offering a first step in cleaning up our oceans. Even though fruition of this idea is probably decades away, locating the most impacted waters is key. With a better understanding of the origin and the amount of marine debris in our oceans, Johnston says we can move towards solutions. Using drones, the Race For Water project team will be able to get a detailed look at exactly what and how much trash is washing up on beaches around the world. During his past research trips, Johnston says it’s not uncommon to find old fishing gear, lighters, and toothbrushes along beaches. He’s also found unusual items like computer monitors, televisions, and portable toilet seats. 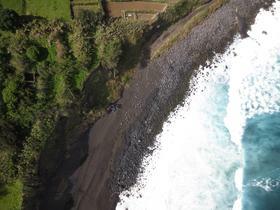 The first Race For Water surveys were conducted in the archipelago of the Azores. The information gathered by the drone was sent from Bermuda to the Beaufort lab where Johnston will be analyzing the images over the next few days. This type of data collection may eventually be useful along the North Carolina coast. In addition to analyzing marine debris, drones could be used for a number of applications. 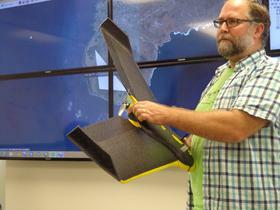 Drones could also prove useful along the coast following major storms and hurricanes in storm damage assessment. They could also be used to map the impact of climate change on reef habitats. The Netherlands based initiative called “The Ocean Cleanup” is targeting garbage patches in oceans around the world to launch a system that would help eliminate plastic pollution. The concept uses ocean currents and long floating barriers similar to oil containment booms to gather debris without impacting wildlife. The Ocean Cleanup project will deploy a coastal pilot test next Spring, however the technology won’t be implemented at least for five more years. Understanding how trash enters the ocean and where the currents take it is vital to cleanup efforts. In theory, the information collected through the Race For Water project could help other organizations, such as “The Ocean Cleanup” know where to place their trash collecting barriers to maximize efforts. Duke University Marine Lab’s Dave Johnston says all of the data from the Race For Water project will be available online. When the Race For Water sailing crew leaves Bermuda, they’re headed for New York where Johnston says they’ve been invited to give a briefing to the United Nations Environmental Programme about the project. To track the progress of the Race For Water Odyssey, go to www.raceforwater.org.